Searches will return results which match capitalization specified in the search string precisely. Class/Struct Includes classes and structs in your search. Any Element Includes all elements in the search. Declarations Limits the search to declarations. Definitions Limits the search to definitions (for functions, methods, variables, and fields). References Limits the search to references. All Occurrences Includes declarations, definitions, and references in the search. 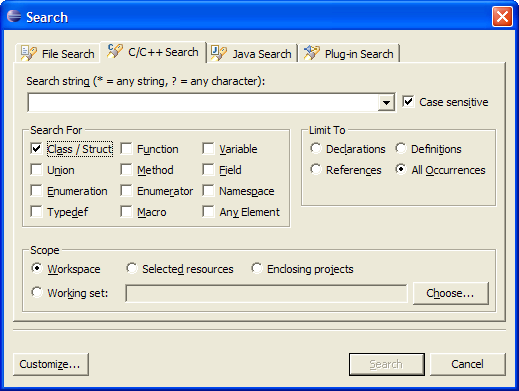 Working sets can be created and used from within the search dialog.